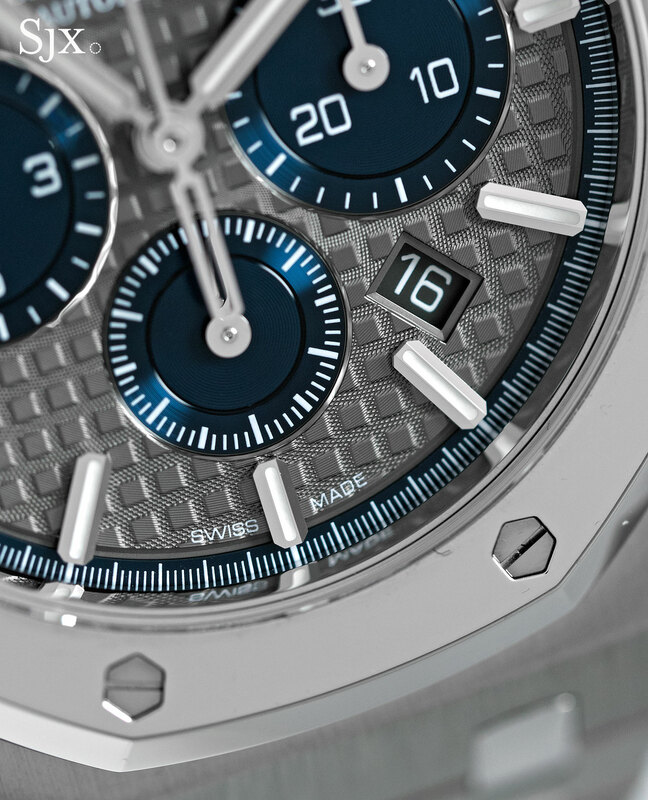 Audemars Piguet prudently relied almost entirely on the Royal Oak for its SIHH 2017 line-up, which was well received despite the design being well know, proving the power of the octagonal watch. 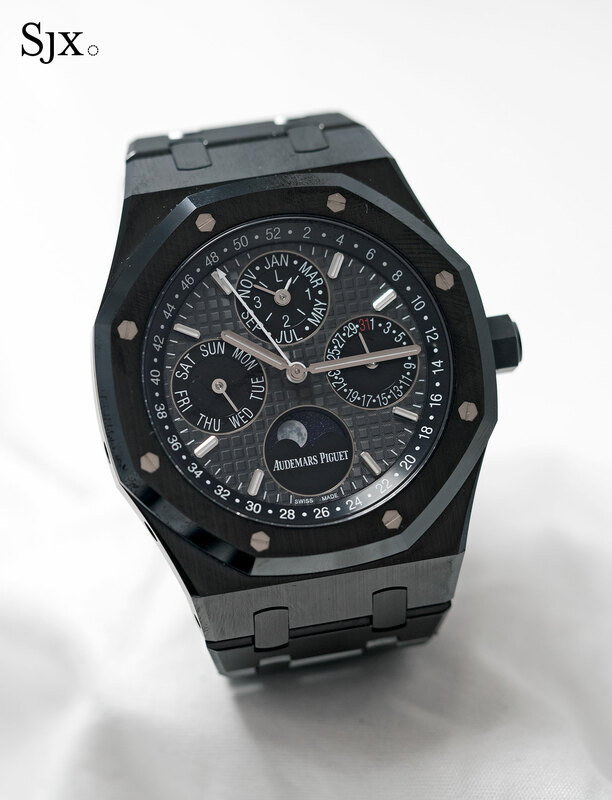 The headliner of the collection was the Royal Oak Perpetual Calendar Ceramic, announced just before the fair. 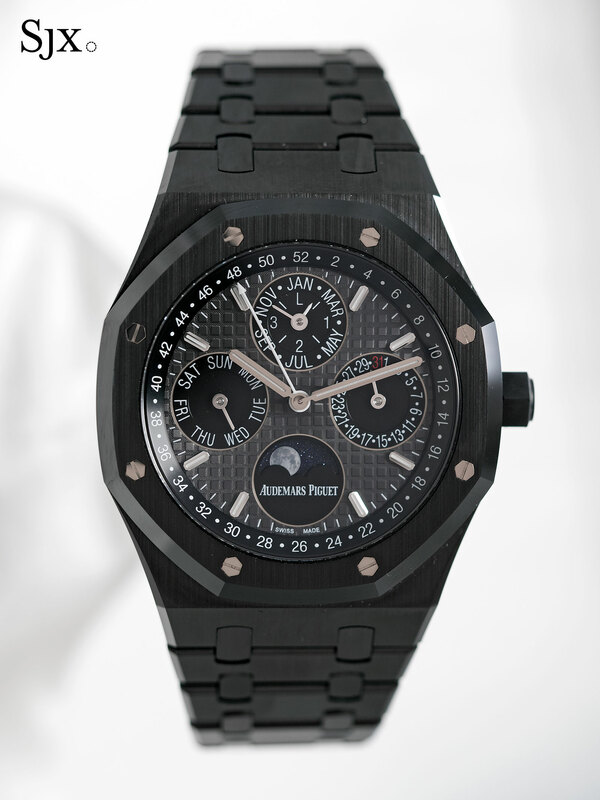 It is exactly what the name implies, the Royal Oak perpetual in black ceramic. What makes it novel is the ceramic bracelet, which is a first for AP. 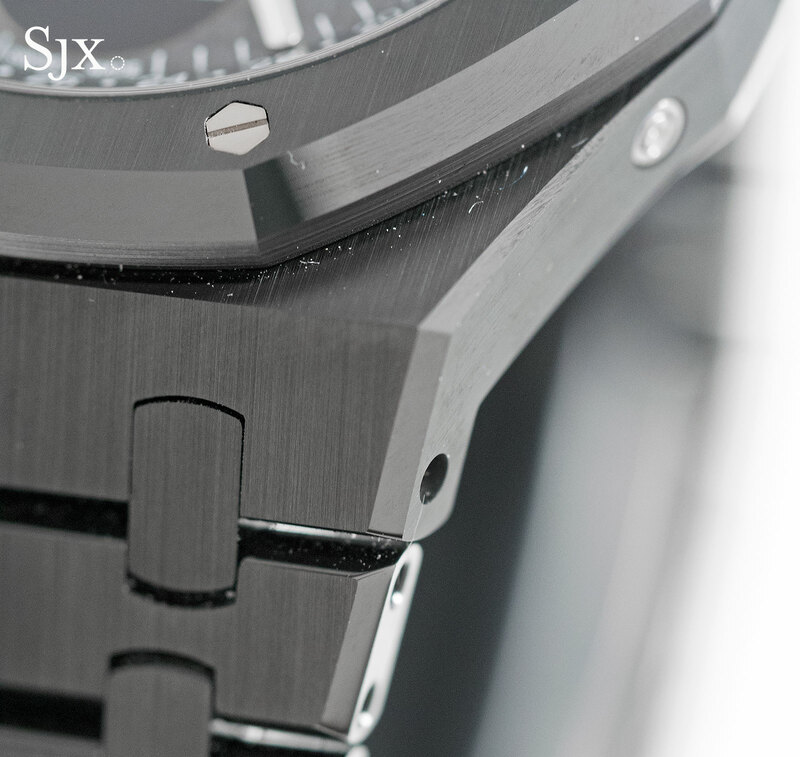 The rest of the watch – 41mm size, calibre 5134 movement and design – is identical to the standard model. There’s a lot of black ceramic on this watch, and it is beautifully finished. 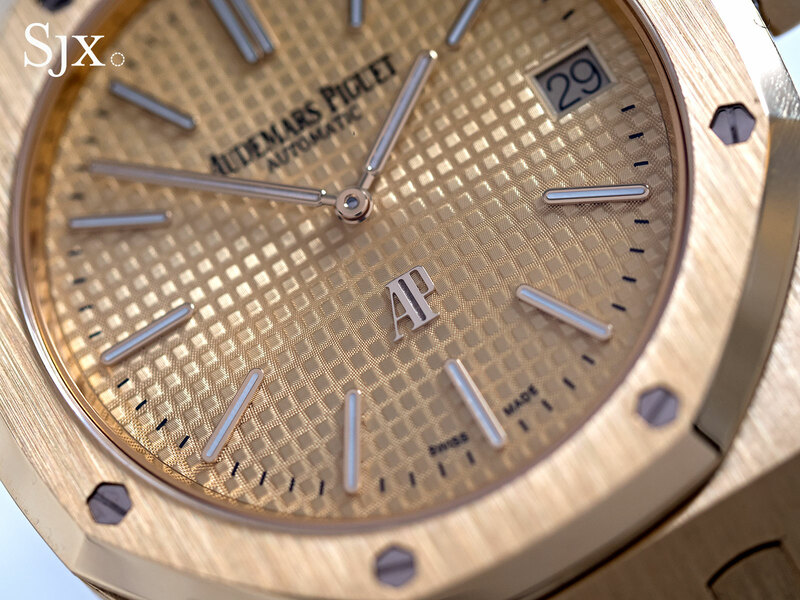 AP arguably does the best surface finishing for ceramic in watchmaking, being able to give it a lustre and texture similar to metal. Both the bracelet and case have the alternating brushed and mirror surfaces that characterise the Royal Oak (though the grain of the matte finish is distinct from that of metal), giving the watch a gleaming, urbane look. But because ceramic is a pale black, rather than deep and dense colour, and also remains glossy even when it is matte finished, the watch is quite shiny. As the saying goes you can’t have too much of a good thing, but there is a lot of black ceramic in this. Priced at SFr85,000 or about US$85,000, the ceramic perpetual costs less than the gold version (about US$95,000) but a lot more than the steel (US$60,000 or so). The premium is attributable to the difficulty of polishing ceramic – the case and bracelet takes six time as long to finish as the steel model. Another existing model in new livery is the Royal Oak Chronograph 41mm. This has been facelifted with two-tone dials, enlarged chronograph registers, as well as more legible markers and hands. 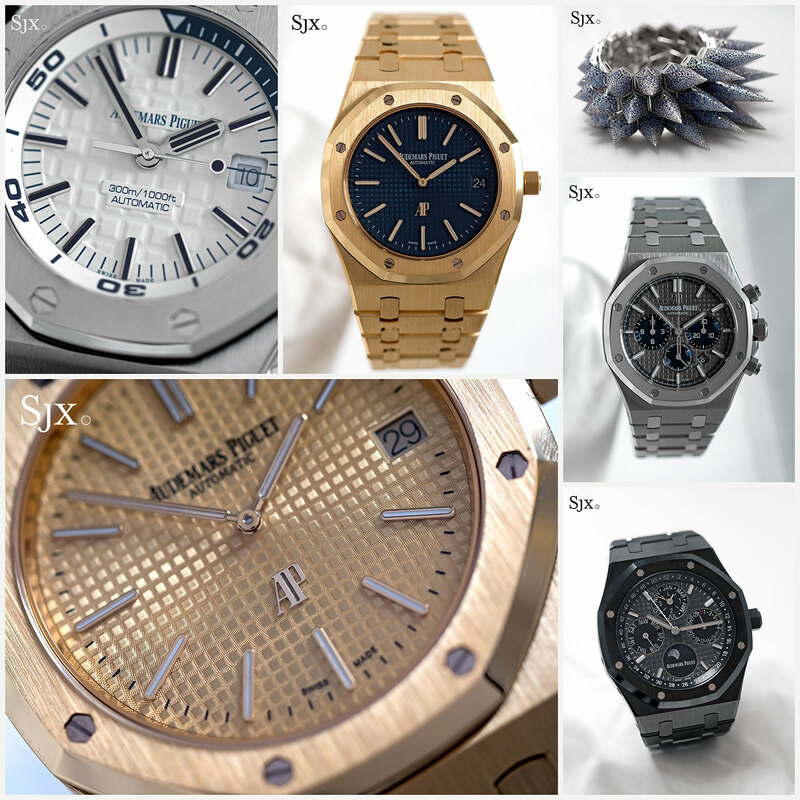 Several models are available in both pink gold and stainless steel, but the most compelling is the boutique-only titanium and platinum version. 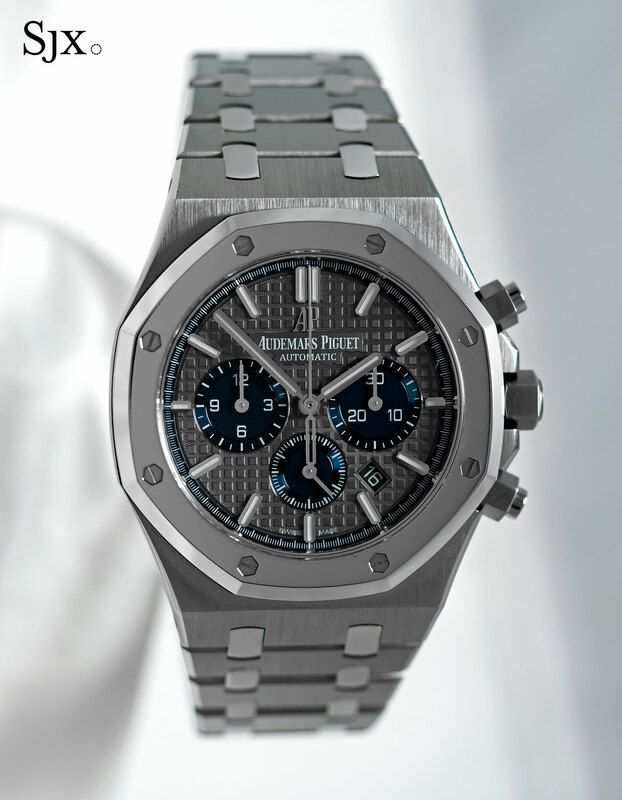 With a blue and grey dial that is reminiscent of the first ever Royal Oak Offshore in titanium, the new chronograph offers another appealing throwback with the bi-metal case. Both the bezel and centre links of the bracelet are polished platinum (AP always gives platinum a polished surface on bi-metal watches), while the rest is brushed titanium. Perhaps because of the platinum bits, or maybe just its psychological effect, this feels heavier than a titanium watch would. 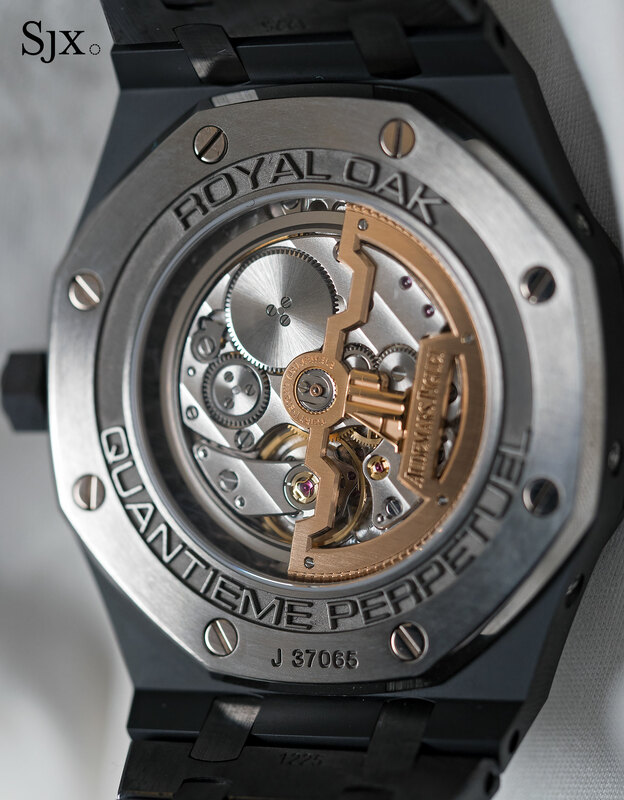 The movement inside the restyled Royal Oak Chronograph is the Frederic Piguet calibre 1185, a movement that was designed 30 years ago. 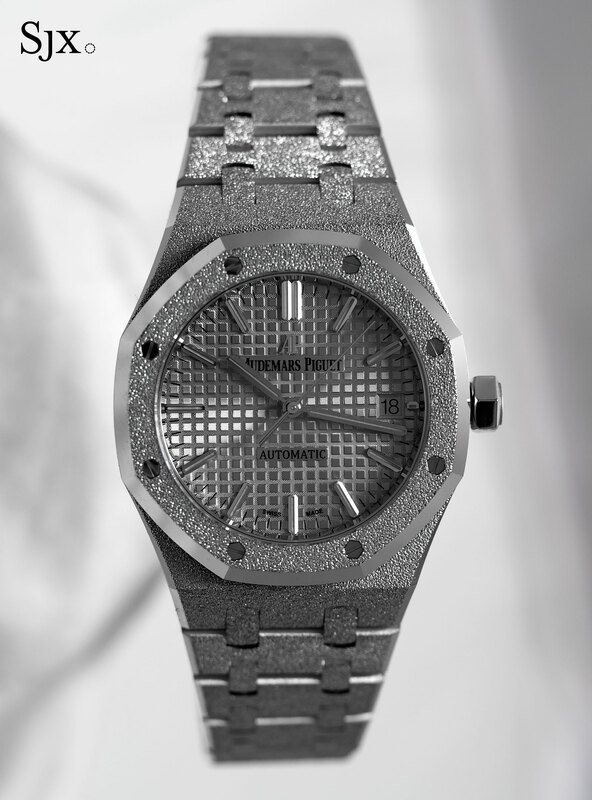 It’s slim, small and sophisticated, but well, 30 years old, proving beyond doubt that the any design as iconic as the Royal Oak is all about aesthetics. The Royal Oak Chronograph starts at SFr21,930 in stainless steel, rising to SFr34,650 for the pink gold on strap, and SFr51,240 for the pink gold on bracelet. And the titanium and platinum version is SFr37,000. 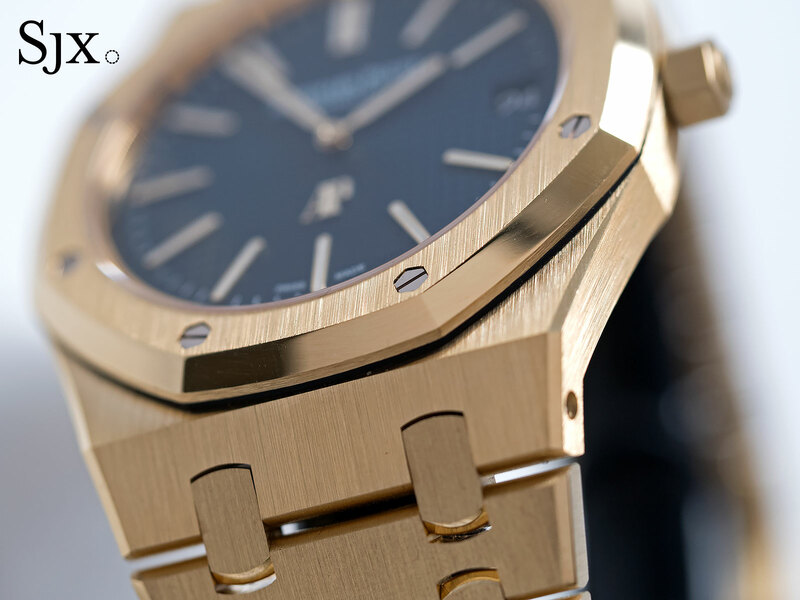 The Royal Oak Extra-Thin in yellow gold is another historical reboot. 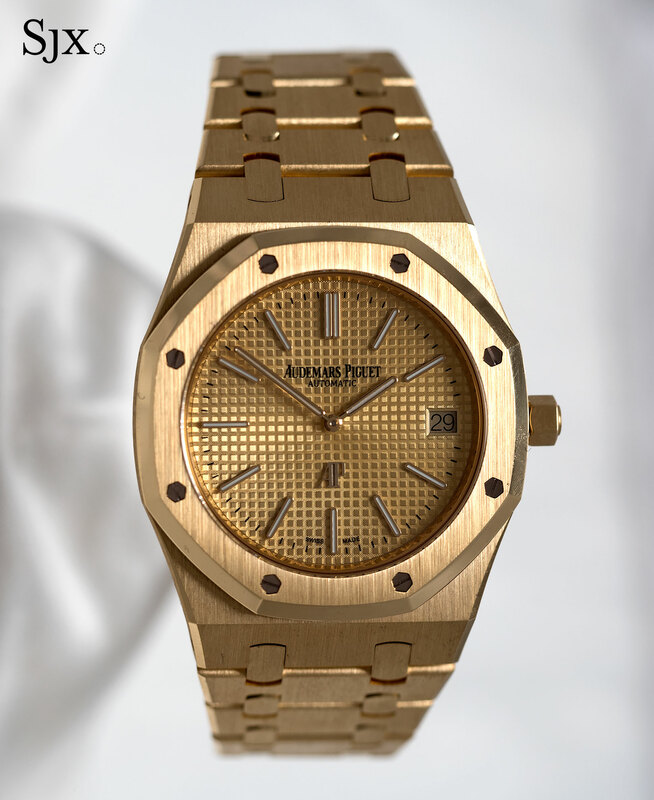 Originally available only in steel or pink gold, the Royal Oak “Jumbo”, as it is sometimes known, was also made in a 50-piece run in yellow gold with a dark green dial for Singapore retailer The Hour Glass. 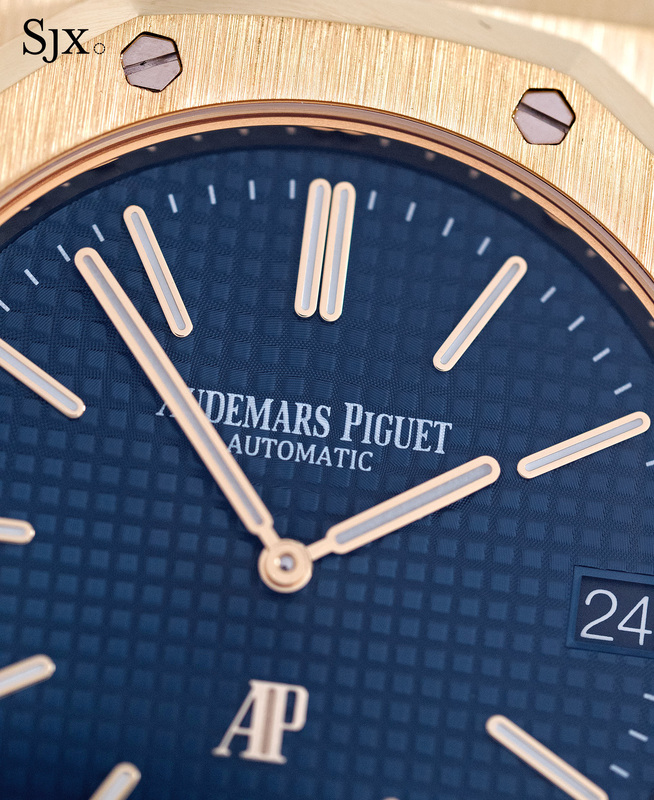 Now yellow gold has joined the regular collection, matched with either a dark blue blue or matching yellow gold dial. 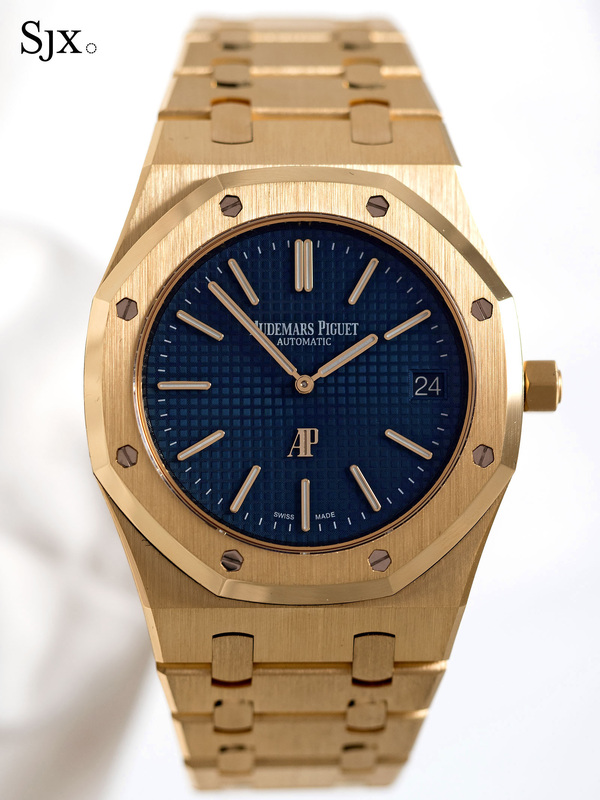 Both look good – being essentially a remake of the original 1972 Royal Oak, the “Jumbo” is a classic in a league of its own – and the champagne dial in particular harks back to the early models giving it a satisfying retro style. The watch is hefty and gorgeously finished, with endless brushed and polished surfaces that make it feel a bit precious, like all gold Royal Oaks. 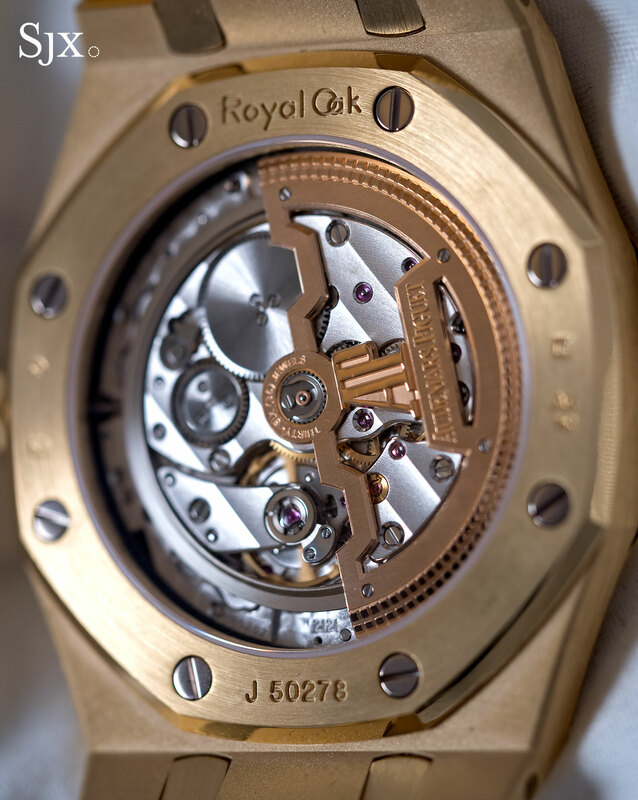 Everything else about the watch is identical to the existing versions, including the 39mm case and calibre 2121 inside. These cost SFr50,130 in either colour. 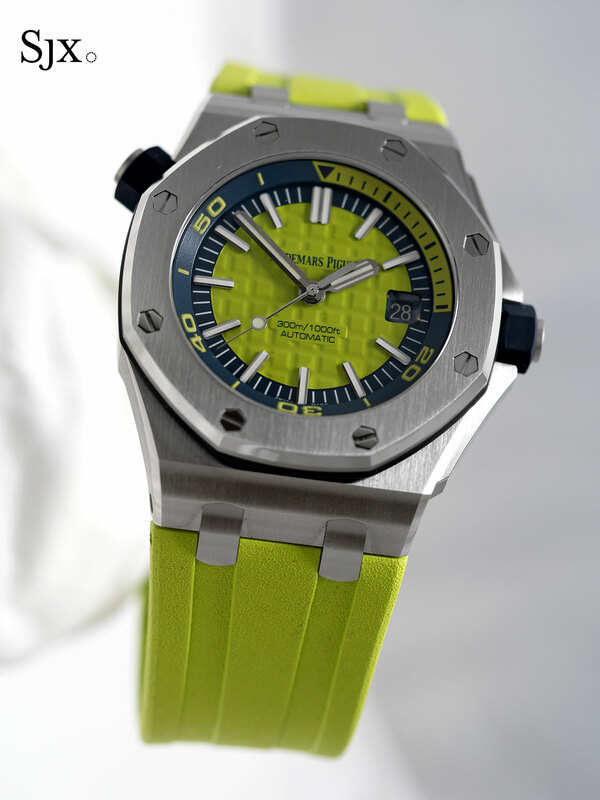 The Royal Oak Offshore Diver “Funky Colour” takes after the Royal Oak Offshore Diver Chronograph unveiled at SIHH last year. It’s essentially a range of Offshore Divers in candy colours of white, blue, yellow, orange and green. Hefty and solid in the hand, the colours are appealing in a fun sort of way, but at the expense of the seriousness of the watch. These are all spec’ed the same as the basic models: 42mm steel case with inner rotating bezel and a see-through back showing the calibre 3120 inside. What is different, besides the main dial colour, is the dark blue (instead of the usual black) accents on the dial, bezel and rubber coverings for the crowns. 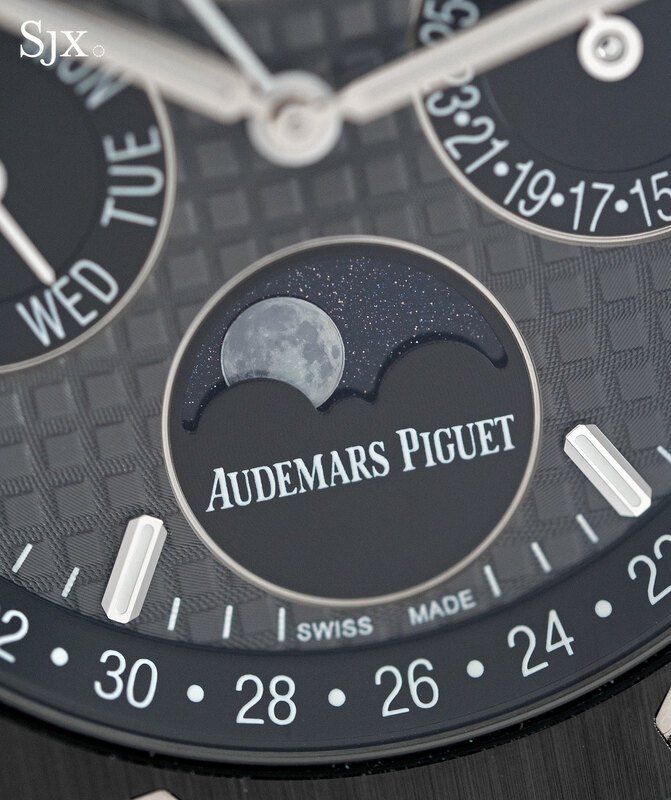 And all of them have glow in the dark Super-Luminova on the hands and hour markers, save for the white dial model. 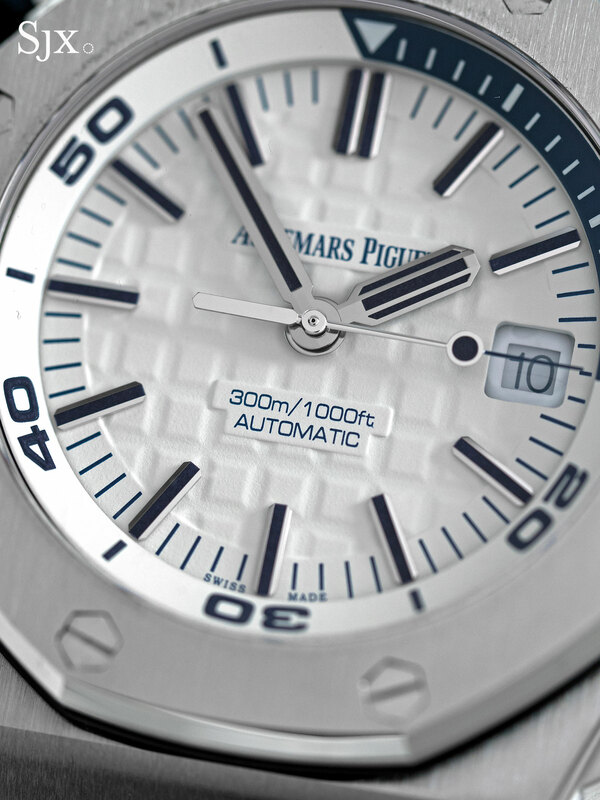 The new Offshore Diver is part of the regular collection, and not a limited edition like the chronograph. 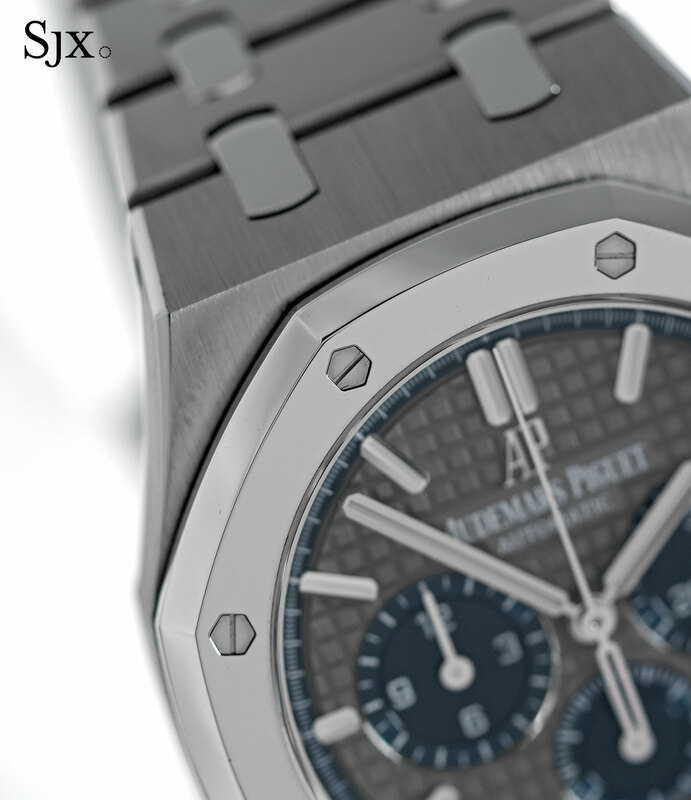 Both the green and white are available only at AP boutiques, while the others will also be offered by retailers. They are priced at SFr17,190 each. 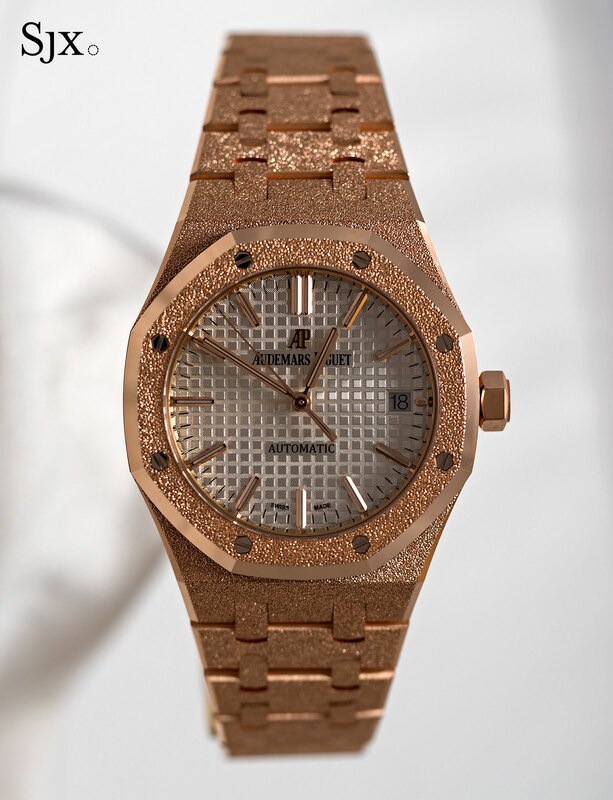 Previewed well before SIHH, the Royal Oak Frosted Gold is a ladies’ watch that’s a striking reinterpretation of the classic design. While the size and even shape of the Royal Oak has varied over the years, it has always been consistently finished with brushed and polished surfaces. The Frosted Gold appropriates a technique from Florentine jewellery to create a grained surface. 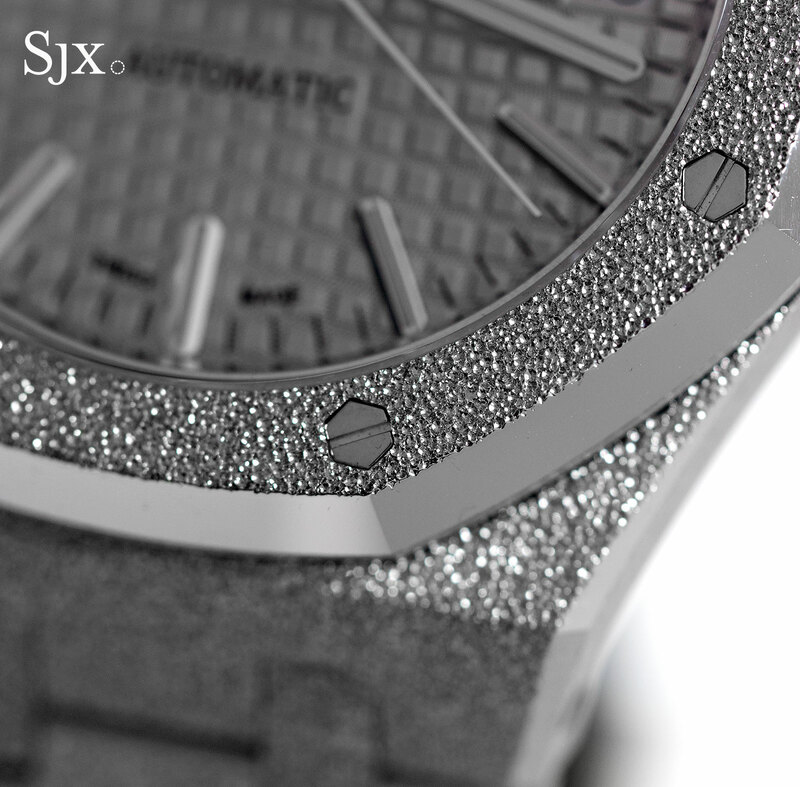 A diamond-tipped tool is used to create a dimpled surface that catches the light nicely, leaving the case a notable sparkle. The frosted surface, however, is not as fine as that shown in the stock images. In the flesh the dimpling is more pronounced, and presumably more durable. Refinishing such a surface must be well nigh impossible. 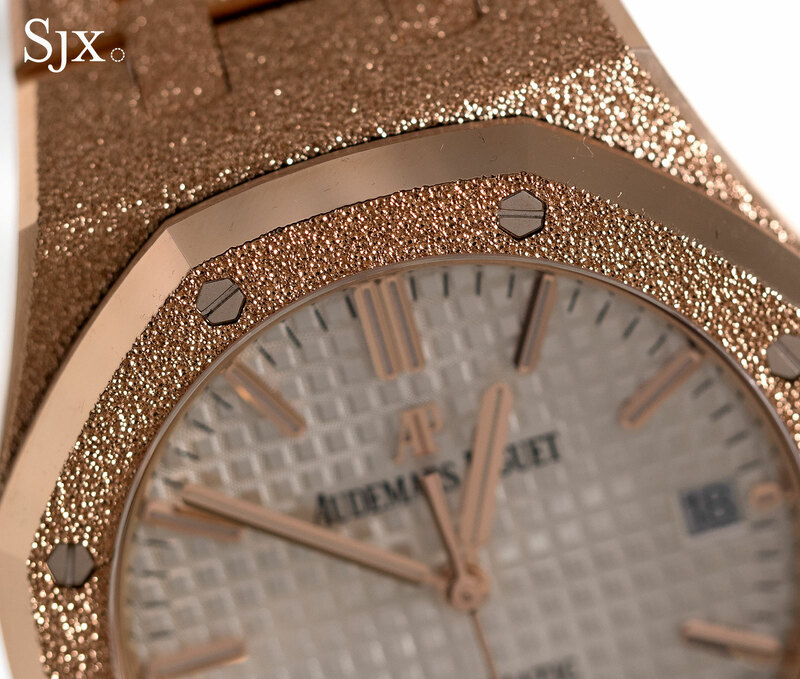 Available only in pink or white gold, the Royal Oak Frosted Gold is offered in two sizes. The larger 37mm has the automatic calibre 3120 inside and costs SFr51,500 in white gold and SFr46,500 in pink gold. The smaller 33mm model is quartz, priced at SFr42,500 in white gold and SFr37,500 in pink gold. 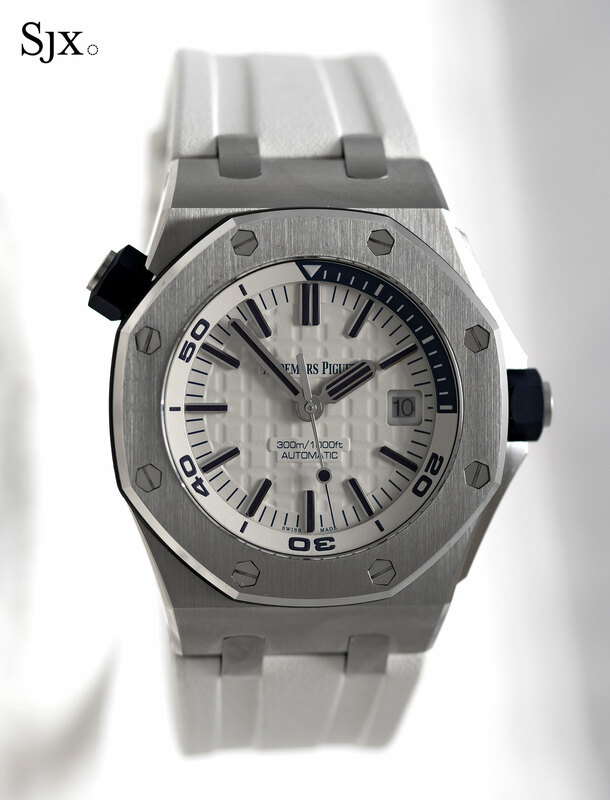 And the highlight of the line-up that is not a Royal Oak is the Diamond Outrage. A follow-up to last year’s punky Diamond Fury, the Diamond Outrage is all spikes and lives up to its name. 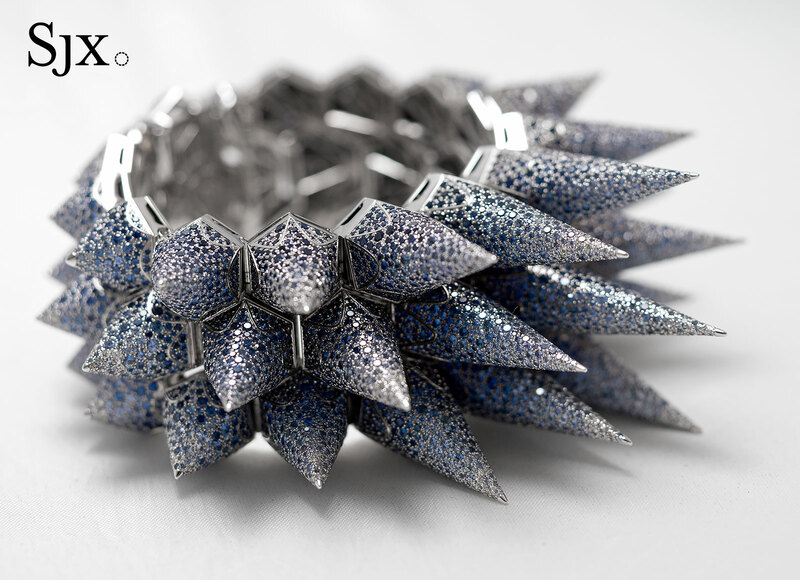 With only two unique examples made – one set entirely with diamonds and the other a mix of diamonds and sapphires – the Diamond Outrage is covered in spikes of varying lengths, ranging from 29.30mm 40.0mm. 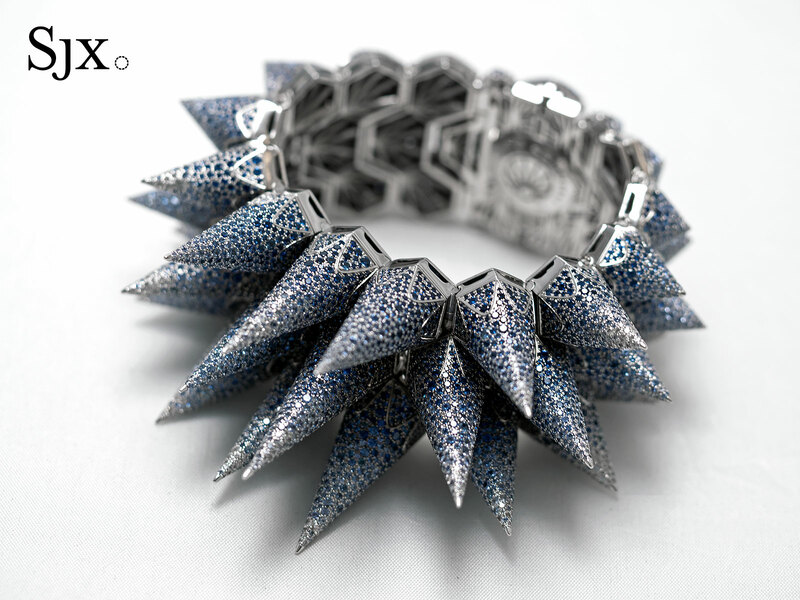 Essentially an intricately hand-made, jewelled bangle with a tiny quartz movement inside, the Diamond Outrage is not something for the faint hearted but impressively bold. It’s priced at just over SFr1m.